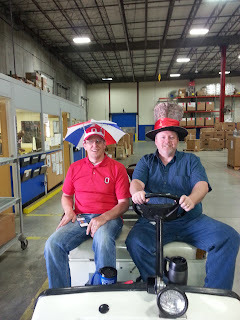 20140523 + Hat day at work with Tim. Lori's stolen iPhone came online today and sent me an email alert, from Ethiopia... Lunch with Kevin and Shalynn. Meetings rest of day. Home walked to Gahanna Grill for dinner. On the walk home stopped to chat with my buddy bighead at the ballfield. The boys and I got home got our supplies in the car and headed to the ballfield, G pitched 4 buckets of balls, Dylan hit and Jack practices play music and announcing the game :-) Home exhausted.